I have a Christmas project I made to share with you all. The base of this is a styrofoam cone I got at a local craft store. 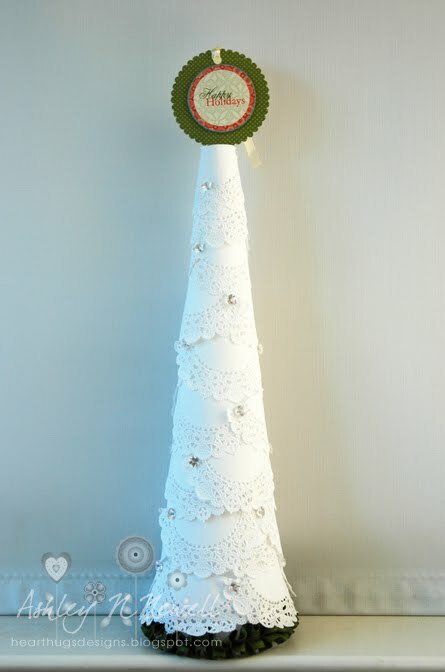 You can find a tutorial for this doily tree HERE. It's a pretty fast craft and would make a lovely hostess gift for anyone you might be visiting this holiday season. LOVE IT! How adorable! And what a great easy looking project! This is so pretty! Love the doilies and the topper! oh-my-jingle-bells....that is so stinkin' cute! what a cute and clever idea :) come on over and link up to MMM!